Fireplaces make a home such a cozy, warm atmosphere. If you are looking to add an elegant element to your fireplace, or simply spruce up your fireplace area, consider this three-panel camelback arch fireplace screen. This medium, matte black fireplace screen not only adds a polished, beautiful finish to your fireplace, but also improves the safety of your fireplace. 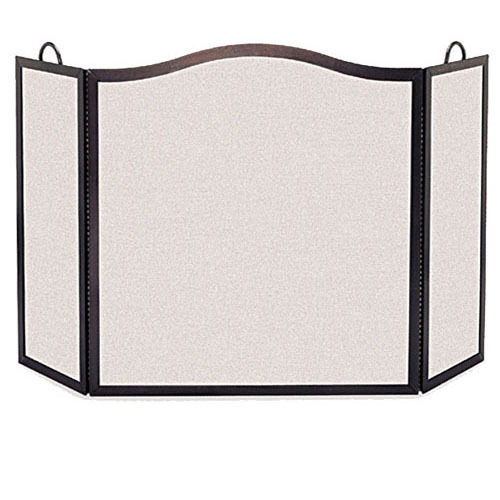 This screen is made of durable steel construction, sturdy piano hinges, and convenient side handles for lifting. The dimensions of this screen are: 30 inches wide and 32.5 inches high, and the side panels are 8 inches wide and 30 inches high. When ordering this screen please allow for an eighth-inch tolerance, for it may differ slightly from the dimensions provided.